The parent and adult child relationship is a particularly strong and unique form of social interaction. 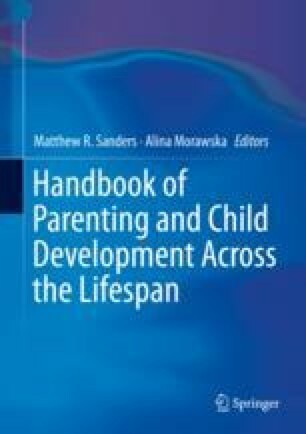 Over the course of the lifespan the relationship transitions through a number of stages; from the dependent nature of parent–infant and parent–child relating, evolving into greater child independence of the parent–teenager and parent–adult child relationships. As such, the involvement and dynamics of parenting shift quite remarkably. The quality of the relationship between parent and adult children can significantly influence the child throughout adulthood, and determines the parent’s own well-being in their late-life. Despite the many positives from the relationship, there are also difficulties with managing the ongoing dependence–independence parenting dynamics and thus tension and conflict can occur. There are several forms of support to help parents with difficulties that can emerge with the relationship with adult children, with some evidence-based parenting interventions showing benefits. A number of recommendations are provided to advance research and practice for the parent and adult child relationship including intervention modules that directly target the interactions between parent and adult child, collecting long-term data, and the inclusion of compassion-focused modules to help continued social interactions, reduce conflict and improve relationship connectedness. The Parenting and Family Support Centre is partly funded by royalties stemming from published resources of the Triple P—Positive Parenting Program, which is developed and owned by the University of Queensland (UQ). Royalties are also distributed to the Faculty of Health and Behavioural Sciences at UQ and contributory authors of published Triple P resources. Triple P International (TPI) Pty Ltd. is a private company licensed by UniQuest Pty Ltd. on behalf of UQ, to publish and disseminate Triple P worldwide. The authors of this chapter have no share or ownership of TPI. Dr. Kirby is a coauthor of Grandparent Triple P and may in future receive royalties and/or consultancy fees from TPI related to this. TPI had no involvement in the writing of this chapter. Dr. Kirby is an employee at UQ. Ms. Hoang is a graduate student at UQ.